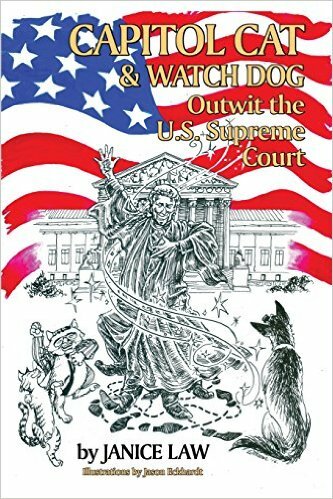 Janice Law is the author of the new children's book Capitol Cat & Watch Dog Outwit the U.S. Supreme Court. 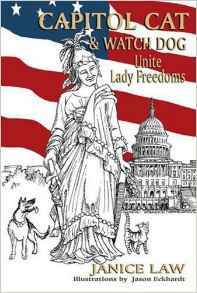 Her other books include Capitol Cat & Watch Dog Unite Lady Freedoms and American Evita: Lurleen Wallace. She is a retired Texas criminal court judge and the founder of the American Women Writers National Museum. Q: How did you come up with the idea for your new book, Capitol Cat & Watch Dog Outwit the U.S. Supreme Court? A: Marketing potential is a #1 analysis new and even veteran authors often overlook or minimize. As a lawyer, and as a citizen, I foresaw that the Supreme Court of the United States (SCOTUS) will be THE national news topic for at least through 2018. Digging through a box of my 2008 book Capitol Cat & Watch Dog Unite Lady Freedoms, about how Congress works, I dusted off a fully detailed, typed, forgotten outline I had composed in 2008 of a sequel on how SCOTUS works. Marketing nirvana! In promotion/marketing I could tap into the overlay of a continuing major national news story! My research indicated there are (apparently) NO children’s books on this important nonfiction topic. I had the playing field all to myself. Magic! Might the original illustrator Jason Eckhardt, still be available? His assent popped on my screen. I added a clever new character, Supreme Cat Nino. Over two weeks I converted the “found” outline into text, and wrote all the poetry spoken by characters. Joan Brookwell, my editor from my print journalism days, agreed to edit. My book designer pulled it together late summer, and we sent it to the publisher. There is a sort of end-of-the-year “deadline” to promote books and apply for book festivals. Q: What do you think young readers can learn about the Court from your book, and what age group do you think would especially enjoy it? A: Ages 8-13 are listed. But adults tell me either they learned a lot from reading it, or they want to purchase it because they want simplistic explanations within an entertaining, fanciful story format. Remember vocabulary lists? In both children’s books, I included one. Everyone enjoys stores involving “sneaking.” So through the eyes of behind-the-scenes interlopers Capitol Cat & Watch Dog, readers “attend” an ultra-private conference watching justices select what cases to hear, witness the traditional formalities of arguments before America’s highest court, and interact with historical judicial figures. Some fun facts children can learn are about quill pens and the court, and how strict court procedures remain. Q: What do you see as the right blend of fiction and history in this book? A: To quote the song lyric, “a spoonful of sugar makes the medicine go down”: About 50 percent is an adventuresome romp of two friends teamed, Capitol Cat & Watch Dog; woven around 50 percent of true facts of how America’s highest court works. Two SCOTUS Justices, Sonia Sotomayor and Sandra Day O’Connor, sent me complimentary personal notes on how much they loved Capitol Cat & Watch Dog Outwit the U.S.Supreme Court. So I must have got it right. As a lawyer and author, that was a thrill. Q: You’ve written for children and adults, fiction and nonfiction. Do you have a preference? A: I enjoy both. This is my seventh book, and my second children’s book. If you are going to write a book for children, my idea is that the subject matter might as well be useful, important nonfiction through which they could learn something of historical value. As an example, I note famed celebrity biographer Kitty Kelley’s first children’s book is about Martin Luther King’s 1963 March on Washington. A: I am still doing publicity for “Outwit” because President-elect Trump will soon announce his SCOTUS nominee for one open seat. A: My 2015 book (my sixth book) is nonfiction: American Evita: Lurleen Wallace, a never-fully-told biography of America’s third woman governor, part of a husband-wife political team of Southerners, set against the tumultuous backdrop of 1967-68 in American history. If that nonfiction seems to track real life Bill and Hillary from Arkansas, you are right. Kitty Kelley told me: “Janice, NO one wants a real biography”. She explained that family members want an authorized, sanitized version of a life. She has written controversial best-sellers about the lives of Frank Sinatra, Nancy Reagan, Rock Hudson and others, where there was high-spirited pushback from the family and friends. I faced a similar pushback with American Evita: Lurleen Wallace. 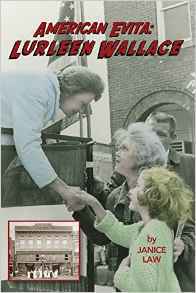 Interestingly, Wallace family members never complained about how the facts portrayed Governor Lurleen Wallace, about whom almost nothing had been written until my 2015 nonfiction book. To me, Lurleen, whose racial and social views were not the same as her infamous husband’s, was an inspiring figure, who triumphed over circumstances that would have derailed most women of that 1960s era. She was a non-high school graduate, a dime-store clerk from an economically disadvantaged farm family who, in 1967 was listed as one of the most admired women in the world. However, some family and friends joined forces in pushback against American Evita: Lurleen Wallace, because, as they indicated via surrogates in public and private confrontations, they disagreed with my factual portrayal of their father, fiery Alabama Governor George Wallace. The Montgomery NPR station taped an interview with me on American Evita: Lurleen Wallace, which never aired. Some Alabama signing and speaking opportunities disappeared. Biographer Kitty Kelley was right.